241: Monday Motivation, Fat Loss Mindset For Vegetarians (Part 1). Although lessor quality meat pies and batter covered hot dogs were pretty good too. And my mums lamb burgers…. and veal schnitzel. Until I changed my mind completely. It was probably a slow build-up however it felt fairly instantaneous… from meat up to 3 times a day to vego for 20 plus years. The change had nothing to do with taste. Obviously, because meat is delicious. It had nothing to do with health either. Or body composition. The thing that made it really super easy to give up meat for good was my mindset changed. In today’s show I’m covering my 6 steps to create the most effective: Fat Loss Mindset For Vegetarians. You may have heard me say: If your mind is stuck you’re wasting your time moving your body. I also believe if your mind is stuck you’re wasting your time trying to eat for fat loss. Whether that’s eating for a fat loss goal as a Vego or as a meat eater. It’s all about creating the mindset that makes it easy to take the actions you need to take. Today’s show is part one of two shows that make my 6 step system to create your best fat loss mindset specifically applicable to my fellow vego’s. Part 2 tomorrow. If you’re vegan it’s going to be just as useful. Actually if you’re in a position where you have ANY changes you want to make to your nutrition that you’ve struggled to stick with in the past then these steps are absolutely applicable to you too. As a side note: I’m also going to cover these 6 steps each in a whole lot more detail – one at a time – in the following 6 Friday FAQ shows. For now let’s first cover the WHY and then power on with the steps. 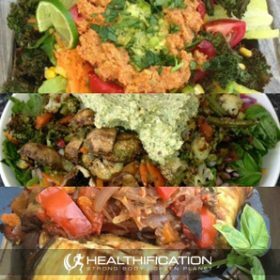 So, specific to my vego friends, WHY you want to bother to put the effort into creating the most effective Fat Loss Mindset For Vegetarians is for me comprised of 3 components. A: This is the mindset you want supporting you – working on auto-pilot – when your initial ENTHUSIASM wears thin. Sure it’s easy to boldly declare you’ll never eat meat again after spending some time on a Peta or similar website. You’re full of emotion, passion and heart-wrenching facts. However what about a couple of week later when your initial motivation is wearing about as thin as that watery soup they served you while the others chowed down on satay chicken skewers and gourmet sausage rolls? 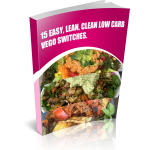 B: This is the mindset you want supporting you when making the lean body vego choice is just really INCONVENIENT. Meal planning and prep at home is easy. However what about when you’re putting in big hours at work or traveling and those meat eaters get to grab a quick lean chicken salad while your only vego option is some carb-fest slab of stodgy pizza, gluggy risotto or hugely uncreative vego pasta? C: This is the mindset you want supporting you when making the lean body vego choice is abnormal and draws JUDGEMENT. These are things you’re going to be facing with any new approach to eating. Whether it’s Paleo, Gluten Free, Dairy Free or whatever. Alright, let’s get to it. Step one: DEFINE Your Approach and Your Boundaries. Step two: ALIGN Your Approach with Your Values and Beliefs. Step two gets emotion working for you. It’s more than the emotion of “Wow that’s a yummy looking pie!” It’s utilising your strong desire to live aligned with the values you are naturally attracted to. Those values – or emotional states – you seek out before all else. I covered Values in show #095. It’s also utilising your need to live aligned with that which you believe to be true about yourself. Your personal identity beliefs. I covered Identity Beliefs in show #216 and Beliefs in general in show #006. So this is the WHY part of the process. Why you eat what you eat. Why you don’t eat what you don’t eat. If there’s an in-congruency between what you say you want to do and the actions you take then it’s likely nothing will change. You’ll feel in conflict – with YOU. Living out of alignment with your values and beliefs is really uncomfortable. To put it mildly. To give you an example: Integrity is a value of mine AND “I am a person of integrity” is a personal identity belief of mine. If you didn’t listen to show #216 basically anything that follows: “I AM” is a personal identity belief. You will defend these beliefs passionately so it’s worth choosing them wisely! If in the Define step I decide I’m committed to eating vegetarian. And perhaps for me that means free range organic eggs from the farmers markets are ok but no meat or meat products and only occasional high quality fish and dairy. Then in the Align step I’ve got my boundaries. I would feel a lack of Integrity if I were to then bend the rules and buy cage eggs because they are cheaper or share a pizza with meat on it becauseeveryone else is. Step three: ELIMINATE the Obstacles That Could Sabotage Your Approach. => Rather than dining out at your previous fav steak house or burger and ribs joint and being stuck with the average vego dish choose a restaurant that has more appealing vego options. => If there are predictable times – like lunch time at work – or at the end of the day when you get caught short and the quick, more easily available meat option is ultra tempting then you need to plan your alternatives. Perhaps it’s making meals on mass once or twice a week. Maybe it’s sourcing the online solution or that less obvious cafe round the corner that does awesome vego salads that you might want to enhance with an extra sprinkle of nuts or seeds for some more protein. => At the very first opportunity politely, respectfully yet resolutely announce your decision to anyone offering you food that is not in alignment with your goal. No wishy washy remember? The more clear you get the easier you make it for other people to respect your choices. And, you’ve really only got yourself to blame when your colleague keeps bringing you tempting meat laden pizza if you don’t let them know. On this last point one of the things that I’ve found super helpful really didn’t come naturally to me.Especially as a self-righteous self-obsessed little 16 year old when I first turned vego. NOW, in explaining my choices be it with food (vego – or low carb – or dairy free) or even with exercise I now come from a place of ZERO JUDGEMENT. In return I seem to experience less judgement being reflected back at me. That tends to be how it works. Obviously there are limits. I still believe I would leave a restaurant if someone at my table ordered fois gras. I can’t – No, make that WON’T handle that level of brutality. Equally I wouldn’t agree to a going to a restaurant that served fois gras, but what if I didn’t know before I got there? And it was a group booking? That’s a whole other rabbit hole. Will dig in a little with step four. In tomorrow’s show we’re continuing with the HOW. I have steps four, five and six: EDUCATE, STRATEGISE and PRIORITISE. To get actionable today lets go with Step three: ELIMINATE the Obstacles That Could Sabotage Your Approach. Again, to be clear this step rocks for any eating approach you’ve committed to. And it’s important to regularly do a little audit to see if any new obstacles have crept into your routine? Perhaps the open bottle of wine left over from the weekend that makes alcohol free Monday more challenging than it really needs to be? I’ll finish today’s show with a quote from Paul McCartney, “If slaughterhouses had glass walls, everyone would be a vegetarian”. I’ll be back tomorrow with the Tuesday Tucker show and: Fat Loss Mindset For Vegetarians (Part 2). If you liked this you’ll also like: 3 High Protein Vego Salads. How to stay on track with your food and IMPLEMENT all the guidelines in this post? Create the MINDSET that makes your best food choices easy and sustainable. 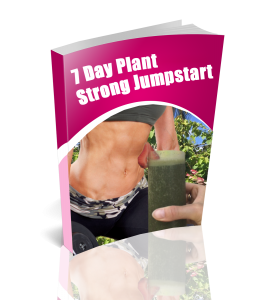 My Free e-Book: 7 Day Plant Strong Jumpstart shows you how!